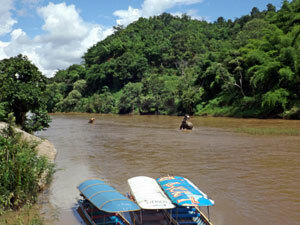 Directly from the resort by long-tail boat to the Karen Ruam Mit village. Here you make a elephant trip to experience the lifestyle around this village. 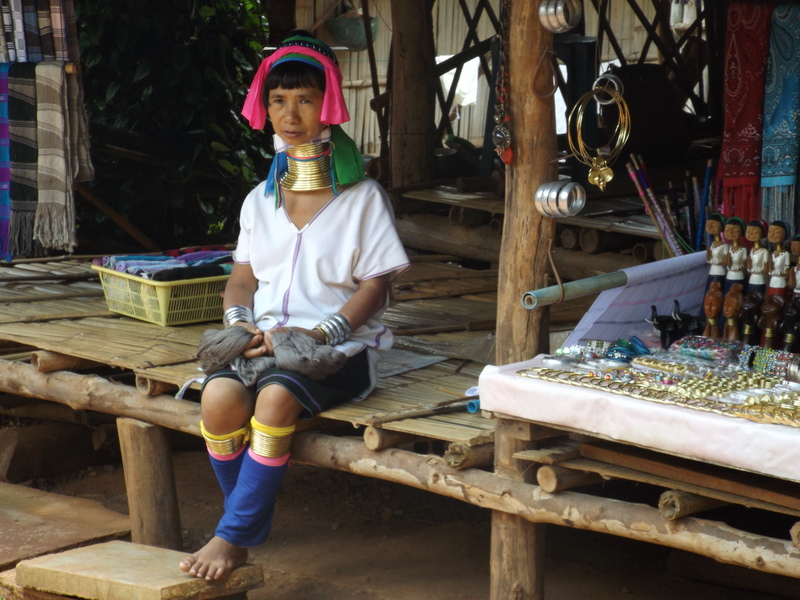 We continue to a Lahu Hill-Tribe village and have a walk around this village. After this experience we continue the trip to the Hot Springs, here you can have a refreshment in the mineral pool, and children can boiling some eggs. Long tail-boat 5 hours, (when you want extend the time for 1 hour is 200 THB extra) (The boat man will walk around with you, at the Lahu Hill-Tribe village). Admission fee Hot Springs (30 THB swimming or 50 THB Hot-spa-cabin p person). *Tour 1 Include Elephant trip for 1 hour. 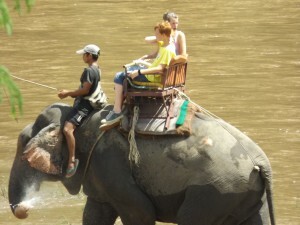 *Tour 2 Include Elephant trip for half hour. 1. First we visit THAWAN DUCHANEE (Black-house). 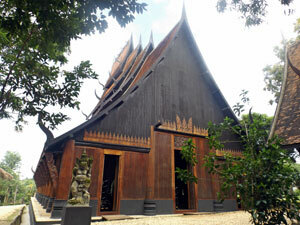 The house is a masterwork of Thawan Duchanee, who was born in Chiang Rai. Mahawiharn (the cathedral) The source and inspiration in an Buddhist art and architecture design. We continue our tour to Wat Huai Plakang,it’s a Chinese Temple and a large Buda on a hill. 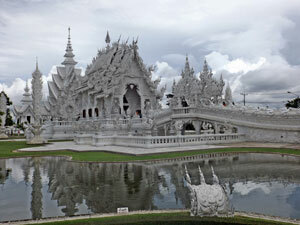 At last we visit the most amazing Temple of Chiang Rai, the Snow White Temple (Wat Rong Khun). This Temple is different from any other Temples in Thailand. Incl. transportation, petrol and Guide. 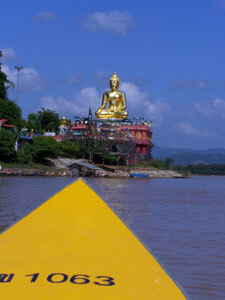 We have two different tours to Golden Triangle. Both are full day tour; start at 08.30 am finish about 18.00 pm. The Royall Villa was originally built as a summer residence for the Princess Mother, and now houses a museum and displaying her work to improve the life quality of local Tribal. 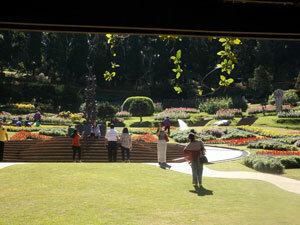 The Mae Fah Luang Gardens are a botanical park located on the feet of the Royall Villa. 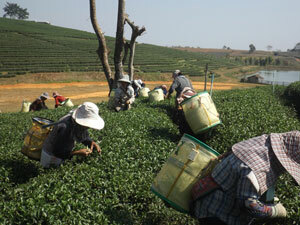 Tea Plantations and Market – Chinese Museum – Doi Mae Salong Temple. If a group between 7 and 10 person its 1,200 Bath/person. We organize a two days downstream cruise On the Mekong river from Houi Xai – Pak Bang To Luang Prabang, aboard of a luxury 36 meter long traditional Lao style riverboat. Depart on: Sunday, Wednesday or Friday. Arrive on Monday, Thursday or Saturday. Price in twin sharing is 4,500 Baht/person, Children till the each of 12 half price. Included in the cruise prices are: Special chartered boat with soft cushion seats, Modern toilet and safety equipments on board Immigration assistance, hot lunch on both days of journey, tea & coffee and fruits. Room & breakfast at hotel Pak Bang. English speaking staff during your journey.